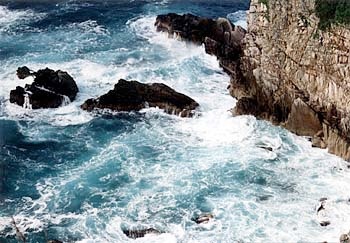 Because this route links two of Japan's major islands, your options are myriad. - First and foremost, Onomichi is such a nice little city that it's well worth going a day or two early (or staying a day or two if you end up there). These photos show two of the reasons: the temple Senkoji, with a great view of the harbor, and one of the other temples on the walking route with the largest sandals you've ever seen. 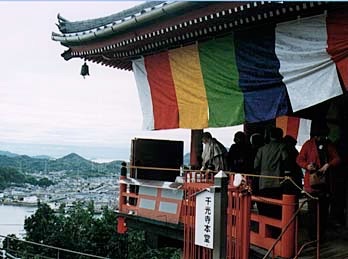 - Not far from Onomichi to the east is Tomo, shown in the photo below. A smaller town and therefore quieter than Onomichi (and quite a bit more mountainous), Tomo has no budget accommodations but is very picturesque and well worth a visit. - A short distance west of Onomichi, Takehara is a typical modern rural town except for one small traditional section that is very nicely preserved. It probably doesn't merit a special trip, but it's worth a stop if it's on your way. - Further west, Hiroshima surely needs no introduction - a visit to the Peace Memorial and heartbreaking museum are a must on many visitors' itineraries.